The serial entrepreneur, and CEO and Managing Director of Pearson Education Services says she has been driven largely by what she calls "start-up" energy. It is like marrying your daughter off," says Meena Ganesh, 47, serial entrepreneur, and CEO and Managing Director of Pearson Education Services. Ganesh is talking about the heartbreak involved in selling a thriving business one has incubated. She should know. She had to do it with CustomerAsset, which she and her husband K. Ganesh sold to ICICI and is now ICICI OneSource, and again with TutorVista, which Pearson took over. "One has to think of what is right for the company at that stage. There is a pang. The attachment continues," she says. 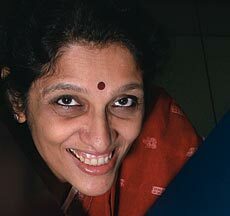 In her 26-year career, Ganesh has been driven largely by what she calls "start-up" energy. She is associated with several young, nascent entrepreneurs as an angel investor or mentor. As an entrepreneur, Ganesh has been a pioneer: building businesses in areas hitherto unexplored, creating categories that did not exist. For now, the rapidly growing and evolving field of education is keeping her excited and totally involved.